but science has no answer. to the traffic of rapids and the blue jays' shriek. to balance the hypnotic sawing of insects. the herons have dropped their willow batons. without frogs. Where have they gone? 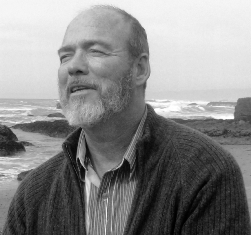 C. E. Chaffin (1954 - 2013) was a family physician who also enjoyed careers as a poet and singer/songwriter. A contributing editor for Umbrella, and publisher of The Melic Review for eight years, C.E. was raised in Southern California then lived for many years on the Mendocino Coast of northern California with his wife and editor, Kathleen, and a dog and cat. Father of three daughters and grandfather of one, he enjoyed gardening, hiking, and fishing. Learn more about C.E. here and click here to enjoy an animated version of him reading this poem. I love frogs. What a lovely poem. The music of frogs and toads is in full chorus in the bog behind our house. I love this time of year, going to sleep to this song, but I am also concerned that this song may fade away. Take care of our planet, please. This poem does justice both to the magic and the reality of our world in a beautiful way.